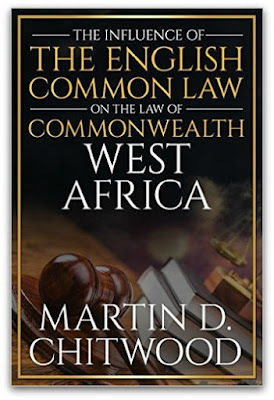 This 86-page look at the cultural influences of English Common Law and how it has been applied to West Africa leaves the reader with a solid pause for thought. As you begin to read “Martin Chitwood's Influence of English Common Law,” directly out of the gate Chitwood examines the dynamics of English law and the massive cultural differences of the Sub-Saharan African people. This is not a “law” book per se. For this reader, it was an interesting view at how an establish system of law effects social change and society as a whole. The book, at 86-pages, is obviously a brief read. But there is no lack of interest and I was left with a lot to think about. It is a highly enjoyable read for anyone who bothers to look beyond their own back yard and attempts to understand the intricate dynamics of our world as a global citizen. On that fact alone, I place is as a must-read! “Martin Chitwood's Influence of English Common Law” is available in paperback for $5.38 and on Kindle. About Martin Chitwood: Mr. Chitwood attended the University of Georgia, where he received his A.B., M.A., and J.D. degrees, the last in 1973. He is admitted to practice before all Georgia state trial and appellate courts, the United States District Courts for the Northern, Middle, and Southern Districts of Georgia, and the Second and Eleventh Circuit Courts of Appeals. He is a member of the Atlanta and American Bar Associations, the State Bar of Georgia, the Federal Bar Association, the Association of Trial Lawyers of America, the Georgia Trial Lawyers Association, and the Lawyers' Club of Atlanta, where he serves on the Rules, Practice, and Judiciary Committee. Mr. Chitwood is a member of the Securities Litigation Committee of the Litigation Section of the ABA and the Antitrust and General Practice and Trial Section of the Georgia Bar. He has also been recognized as a Georgia “SuperLawyer” by Law and Politics, each year, since the inception of the award.